"...fine transparency, accurate tonality and stereo perspectives, and impressive fine detailing"
The Indus is our longest running and probably most famous pre-amp, first introduced in 1989. Back then it set new standards for passive pre-amps, being the only British made pre-amp to feature a true stepped attenuator and offering more volume settings (66) than anything else commercially available anywhere. Over the years the design has evolved and the current model, now called the Indus SE, offering 132 volume settings (plus full mute) from its 12 way fine and 12 way coarse controls, is hand-wired with silver plated solid core OFC wire and boasts top quality connectors, switches and resistors for the ultimate in transparency and naturalness. At the heart of the Indus SE is the stepped attenuator volume control. Since passive pre-amps live or die by the quality of their volume control, we have designed the ultimate. There may be several ways to construct a stepped attenuator including relay switched resistors, so called "ladder" attenuators, "single series resistor", but these designs which may look good on paper have hidden technical flaws such as wildly varying impedance or excessively high resistor values. The approach which we have taken and refined for over 17 years is novel but simple and elegant. By combining two 12 way switches we can offer both fine and coarse volume controls giving the user unrivaled fine control (less than 1dB) over a 67db range, while at the same time keeping the resistor count low, resistor values low (thereby reducing the effects of switch capacitance) and maintaining the impedance within tight limits. The switches themselves have high quality silver plated contacts which are hard wearing, have a self cleaning action and make contact on both sides of the rotor for even contact pressure and the best contact integrity. Finally, the resistors are close tolerance components which give the attenuator better than 0.1dB channel balance right down to its lowest setting. The design of this stepped attenuator might be unconventional but there's no doubting its quality with each one painstakingly assembled by hand in our own workshops. 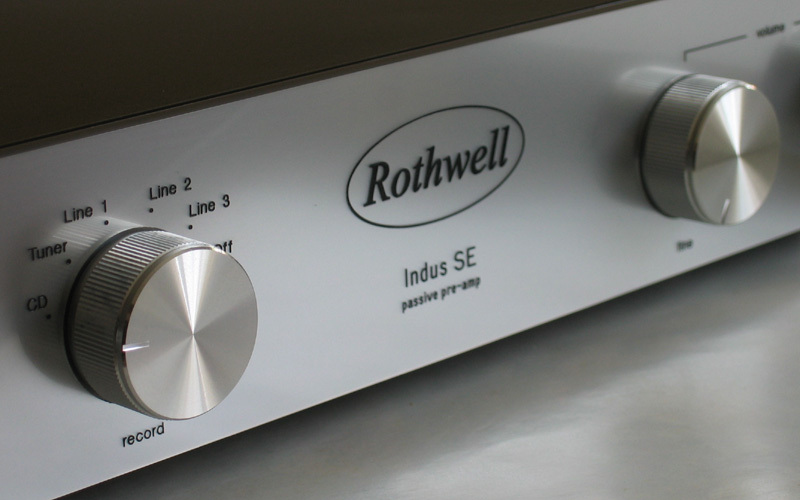 While passive pre-amps are by nature low on features, the Indus SE doesn't force compromises on the user. There are 5 line inputs plus a tape input, one pair of tape outputs and two pairs of main outputs and there are seperate listen and record functions so that one input can be listened to while another input is being recored. This has an additional benefit in that the record selector can be set to the off position so that any recording device connected to the pre-amp is then totally isololated from the source components. The two pairs of main outputs allow easy bi-amping without the need for splitter cables. The sound quality of the Indus SE is hard to describe simply because it is so transparent. It's easier to describe what the sound isn't. You'll find a complete absense of glare, sheen, hardness etc. What you'll be left with is a natural, airy presentation with excellent low level detail and sense of space. Timing and dynamics are also excellent. Overall, this is a pre-amp which will allow you to focus on music and forget about hi-fi. Isn't that the point of hi-fi? Check out the “truth about passive pre-amps" for more a detailed technical analysis of the theory behind passive pre-amps and to separate fact from fiction.